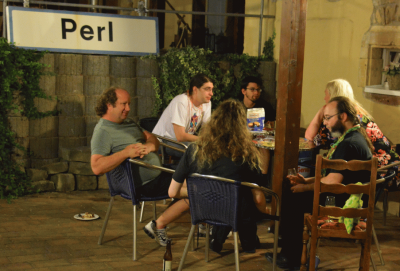 As some of you may know, my partner Wendy van Dijk and me organized a Perl Reunification Summit on the Friday and Saturday before the YAPC::Europe. Organizing this started in May already, when I tried to contact as many people face to face to discuss this, before finalizing the plan. When the plans more or less got final, I basically sent this email to the people I had not been able to contact personally yet. Since it explains a lot of my reasoning for having the Perl Reunification Summit, I thought I’d share this mail with you. As of April this year, I’m on indefinite sabbatical. So I have time to worry about other things than $work. And I worry about the future of Perl. I see several developments that may be in themselves good, but together may spell the end of Perl as a significant programming language. And since I’m very egoistic, I would like to be able to continue to program in Perl in the future. For fun. Or for whenever I would need to / want to get out of my sabbatical and make money in a fun way. all of the new developments in both Perl 5 and Perl 6.
a regular release cycle of both Perl 5 and Rakudo Perl 6.
many new contributors in Perl 5, and some in Perl 6.
a lot of people working on Moose and MOP. hackathons being organized and making a lot of good things happen, that would otherwise would have taken much longer. little communication between communities, other then stealing each others ideas and implementing them slightly differently. further divergence between Perl 5 and Perl 6, will they ever meet? The thing I really miss is attention to being able to use all cores of a CPU, in both Perl 5 and Perl 6. Perl 5 will never be able to transparently support multiple cores, Perl 6 still has the promise of being able to do so in the future. I think this support will be vital to the future of Perl, to prevent it from going the way of MS-DOS in a Windows environment. It will work nicely in a window, but will look (and be) old-fashioned. And not using all of the available resources. So I wonder, will the more or less dwindling user base of Perl 5 (compared to other programming languages), and the as yet almost non-existent user base of Perl 6, ever get enough traction to make it possible for anyone to keep making a living with Perl? In other words, if we’re adding Perl 5 and Perl 6, I fear we’re going for a situation of ½ + ½ = ¼, rather than a situation of 1 + 1 = 3. This is the moment therefore, for me to throw the proverbial coffee cup against the wall. But with a twist this time. Because I have an evil plan. Since I have the time and the resources at my disposal, I would like to call a summit to discuss these matters with a group of about 20 people just before the YAPC::Europe (on Fri 17 and Sat 18 August). I tentatively call this a “Perl Reunification Summit”. It will be held in Hotel Perler Hof in Perl, in Germany, close to the Luxembourg and France borders. It is close to Schengen (of the Schengen Treaty), which to most Europeans means that they don’t need to be checked at the border anymore when going from one country to another. So I would like to think there will be some symbolism involved. But the name is not important. What is important is that a group of “important” people from the Perl communities get together and talk to each other. And see where we go from there. Hopefully be able to create a vision for the future. And so we got together. And talked. Talked a lot. In the whole group. In one-on-one’s. In small groups. Over drinks, dinner, and just while chilling in the yard of the hotel late at night, when the temperature finally got bearable. And we had some group mug throwing to expel the “Perl is dead” meme from our minds. So what will the future bring? I wish I knew. It seems that we agree on the importance of being able to run (a subset of) Perl 5 on Perl 6. So several people are now looking at ways of doing that. And what about me? I’m working on my first commitment now: to blog about the Perl Reunification Summit. If you want to know what’s going on, please check #p6p5 on irc.perl.org. And if you feel up to it: find out ways to support this effort to create the Perl of the future! About Perl, the town, I did a lightning talk at the French Perl Workshop 2010 in Calais. The FPW was on June 12th and 13th, 2010, just 25 years after Schengen Treaty (June 14th, 1985). Besides Perl being related geographically to Shengen, my point was to show that despite Schengen Treaty that is supposed to remove tolls, I had to go through toll to travel inside France borders from Paris to Calais where the FPW took place (this is because the train continues to Great Britain, outside the Schengen space). Thank you for inviting me. It was a very enlightening meetup.